BPI WHEY-HD™ is a rapidly digesting high quality protein that's rich in amino acids to aid in muscle recovery while also building solid, lean muscle. Every serving of WHEY-HD™ gives you 25 grams of protein without the added fats, carbohydrates, and sodium. WHEY-HD™ contains a powerful intra-workout muscle building agent that increases muscularity and fullness making it THE go-to powerhouse protein. 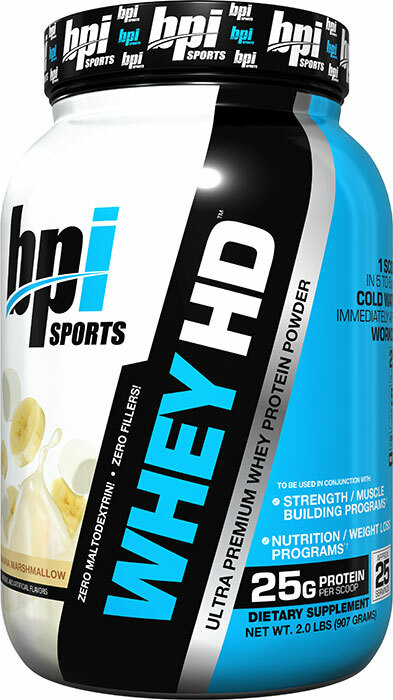 BPI Sports Whey-HD brings you a high quality protein blend. 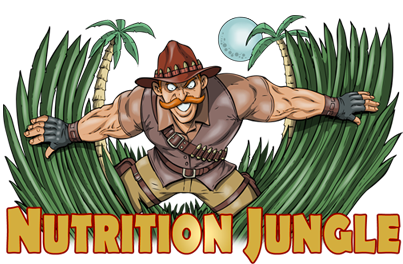 Each scoop delivers 25 grams of protein and only 4 grams of carbs. BPI Sports is the first company to have its products 3rd party certified, guaranteeing that what is on the label is in the product! Mixing 2 scoops gives you a thick, rich, creamy shake that tastes delicious! Mix it in cold water for optimum digestion and absorption of the protein. This high quality formula puts 4 different proteins to work for you… those in the know, know that a blend of proteins are absorbed and utilized better in the body than any single protein. WHEY-HD also has over 5 grams of BCAA'S for muscle recovery, and added glycerol added to increase endurance. 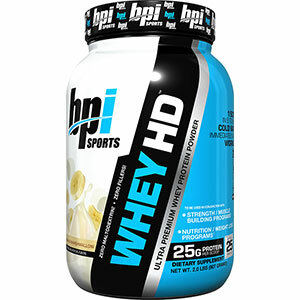 BPI Sports WHEY-HD can be used before your workouts, or as a post work out as well.